Most poker players begin their poker careers in lower limit games, learning the ropes while trying to earn a bit of extra income. One of the trickiest things to figure out is how to transition between limits and how to manage your bankroll. You have to take shots at higher limits eventually; the games will be more difficult and your blood will be pumping when you first sit down at the next limit up. Approaching the transition with a game plan and learning to manage your emotions in a higher stakes games will help a lot as you move up in stakes. Using these top 5 tips on moving up in stakes you can move up in stakes with greater confidence and a solid understanding of bankroll management. Also, if you’re looking for more information on bankroll management in general, make sure to check out our bankroll management tips. Understanding when your bankroll can withstand a higher stakes game without subjecting you to excessive variance is a big part of figuring out how to move through the limits. Cash and SNG players should use a 20 buy-in rule to determine when they are financially ready to tackle the next limit up. If you have $1000 and you have experienced success in the $25 NL game, you should give some consideration to moving up to the $50 NL game. MTT players should use closer to a 50 buy-in rule. This is because multi-table tournaments are higher variance games. Very solid players may go dozens of tournaments without so much as cashing despite playing well. For this reason MTT players should allow themselves a greater cushion before moving up in stakes. These guidelines can and should be modified based on experience and preference. When moving up in limits, it might make sense to approach the move with a plan. If it doesn’t fit your style to plan for a change in stakes you may prefer to just take a shot at the next limit. For some players planning for the next limit is essential to approaching the increased difficulty with confidence. There are a couple of things you can do to prepare yourself for the next limit. 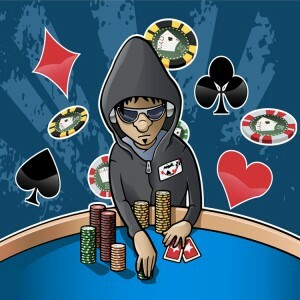 Check a popular poker forum like 2+2 to get a description of the differences between the limit you have been playing and the limit you are moving to. In general you can expect the next limit to be slightly more aggressive with a greater number of regulars. Additionally you may want to spend some time trying to find the optimal table or watching the action to try and familiarize yourself with the play styles of the players in the game. If you do decide to take steps to prepare yourself for moving up in stakes, make sure you don’t overdo it. Eventually you must take a shot at the next limit and you don’t want to run the risk of psyching yourself out. Generally speaking, the next limit up is often quite similar to the limit you have been playing at. If you feel like taking a chance, and you have been playing well, it doesn’t hurt to set aside a single buy-in or entry fee at the next limit up and take a shot. Taking the occasional shot will give you valuable experience in the higher staked game as well as potentially earning you extra cash! Make a promise to yourself to learn from the experience and to get up if you go broke. The biggest mistake you can make when you decide to take a shot at a higher limit is to chase your losses. If you lose your buy-in, move back down. One buy-in is no big deal. You can try again in a week or two after crushing the game you are comfortable in for another week or two. If you decide to move up and really take a run at the higher staked game, play with confidence. You may have the inclination to play tighter, or give players more respect than you typically would at the limits you are used to playing. The difference in play skill between one micro stakes game and another isn’t very large. The skill differences don’t tend to show up in earnest until you try to jump from $50 NL to $100 NL. Therefore you should play your usual game when you move up in limits. If you find yourself in a position where you think a bluff has positive expectation, then take a stab at the pot. Don’t over think it. If you go on a bad run after you move up in stakes, you need to have a hard and fast rule that tells you when you will move back down in stakes. Set this rule BEFORE you move up in stakes. 15 buy-ins is a fair number for moving back down in stakes in cash games, i.e. if I move up to $50 NL, I will back down to $25 NL if I lose 5 buy-ins at my new limit (losing from $1000 to $750). The purpose of setting and adhering to a rule like this is to remove the emotion from the decision to move down in stakes. Poker players are inherently competitive people, and it can be a point of pride to prove that you are capable of beating the game. However, poker is a risky game. You may play perfectly and lose 5 buy-ins in a row. Try to keep this in mind as you evaluate your play and figure out when you want to move back up in stakes.